Argentines Mario and Adriana Alsina celebrated Christmas with the purchase of a 2013 Elantra GLS from Centennial Hyundai at 6200 Centennial Center Blvd. in the northwestern valley. 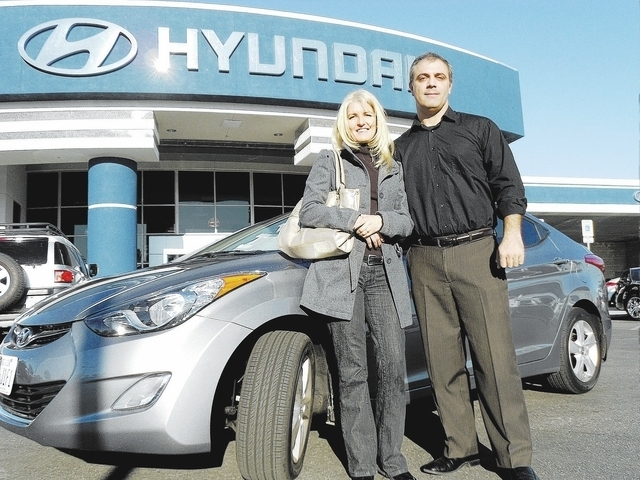 Residents of Las Vegas for almost 11 years, the couple waited until the end of the year to purchase the vehicle, adding the vehicle was their first new vehicle and their second Hyundai. The couple said they saw an Elantra used as a police car in Indonesia during their travels. “It has a very nice warranty along with a good price,” said Mario Alsina, who with his wife is a missionary with the Church Iglesia Nueva Vida near St. Louis Avenue and Sixth Streets and with a Bible institute called Global Harvest Theological Institute that will soon move to 2790 E. Flamingo Road. The Alsinas put 1,200 miles on the car including a trip to Lake Havasu City, Ariz., recently. “We got terrific gas mileage and the car has plenty of power,” Mario Alsina said. The Alsinas praised their sales agent, Paige Poole, who is an Elvis impersonator during his spare time. Centennial Hyundai is part of a locally owned operation that also includes Planet Hyundai Sahara at 7150 W. Sahara Ave. and Planet Hyundai Used Car Superstore at 7100 W. Sahara Ave.
For more information, call 702-483-2200 (Centennial), 702-938-1400 (Sahara) or visit www.planetlv.com.